If you are interested in enrolling in an online program or course, we encourage you to review the Indiana State Online registration process below. If you require assistance, contact us or chat with a staff member. Note: For course-by-course transfer evaluation (for Indiana schools and selected other schools), undergraduate students should visit the University's transfer planning tool. Applicants interested in the LPN/LVN to BSN Program follow a unique set of procedures to apply for admission and to get started. For step-by-step instructions, go directly to LPN/LVN to BSN Program. 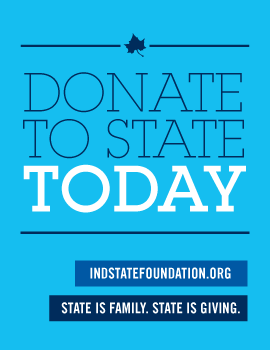 While Indiana State University endeavors to offer all of its programs to as wide an audience as possible, ISU online programs are not available in all states. To determine if a program is available in a particular state, visit program availability. To enroll in an online course or program, an individual must be admitted to Indiana State University as either a degree-seeking or non-degree seeking student and must satisfy minimum admission requirements. Graduate admission: requirements and application instructions vary by program; details are listed by program in the graduate programs section of this site. Students are eligible for consideration for financial aid programs if they are seeking ISU degrees or a required teacher certification and are U.S. citizens or eligible non-citizens. Certificate programs are not eligible for financial aid. For instructions and online applications, visit financial aid. The University offers a limited number of scholarships for entering transfer students who will be studying 12 or more credit hours a semester. Deadlines vary. However, to be eligible for most scholarships, students must be admitted to ISU no later than April 1 for the fall semester and meet other eligibility requirements. For additional details, visit scholarships. In addition to applying for admission to the University, nursing applicants must apply for admission to the Nursing Program. The MyISU Portal offers access to online registration, student University records, e-mail, and other services. Once admitted, students should activate their University Username on the MyISU Portal. Then click "Activate Your University Username." IMPORTANT: Students will need their University ID Numbers (found on their acceptance letters), date of birth, and the last four digits of Social Security Number. Upon completion of the admission process, academic advisors review students' transcripts to determine which credits will transfer. Students should contact their advisors to discuss their transferable credits and plan their schedules for the semester. For more information about transferring college credits, undergraduate students should visit Transfer Central. Courses (and instructions) are located in the Class Schedule on the MyISU Portal. Visit the ISU bookstore to purchase textbooks and other course materials. Once admitted, students must obtain their student identification cards (ID) to access University services. Online courses: To access courses, log on to the MyISU Portal and click the "My Courses" tab. Typically, courses are not accessible until the first day of class. On-campus courses: Dates, times, and locations are listed in the class schedule. Sycamore Express provides one-stop answers and assistance for currently enrolled ISU students. Once admitted and registered for classes, students should visit and bookmark this site for assistance with billing and finances, graduation, and more.